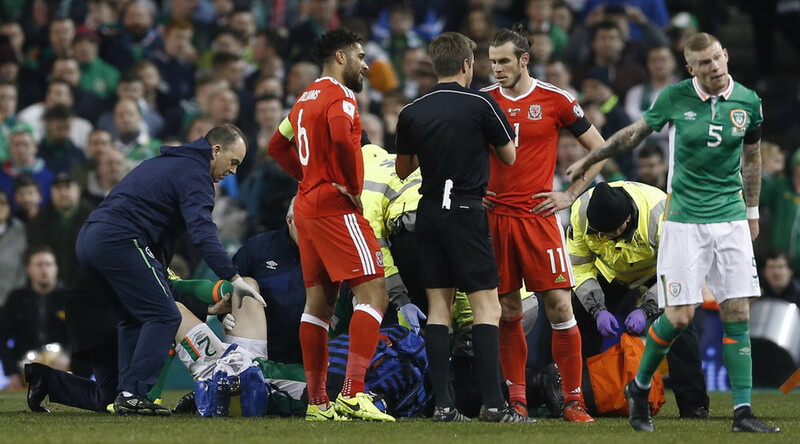 Republic of Ireland footballer Séamus Coleman’s career is in jeopardy after he sustained a horrendous injury following a tackle by Welsh footballer Neil Taylor. Coleman’s leg could be seen breaking in a horrific incident broadcasters refused to replay. Coleman, 28, who was captaining the Irish side, was attended to immediately by medical staff before being stretchered off the field and provided with oxygen. Broadcasters who aired the game live did not show a replay of the incident due to the severity of the injury, but the look of horror on his teammates’ faces said it all. Taylor was shown a red card and sent off the field following the tackle which occurred in the 69th minute. The game went on to be a scoreless draw with Coleman’s injury the biggest news of the night. Well wishes poured in for the player from both the Irish and Welsh football associations, as well as from Premier League side Everton, with whom Coleman plays. Very best wishes to Seamus Coleman. A quick recovery and No doubts I'm sure he will be back better than before. Coleman will undergo surgery Saturday on what is believed to be a double fracture of his lower right leg, RTÉ reports. Details of his recovery are still unclear, though the full-back is expected to be unable to play for a lengthy period. Meanwhile, Welsh manager Chris Coleman defended Taylor against any backlash over the tackle saying the player did not mean to cause such extensive damage. "Neil Taylor is not that type of player. He's had a serious injury himself. He's a great boy, he's a cracking lad,” the manager said. Poor Seamus Coleman. Disgusting tackle by Taylor. Bale should have been sent off as well. Can't talk about the draw! !absolutely gutted for Seamus Coleman!horrible break!It always seems to happen to the good guys! !